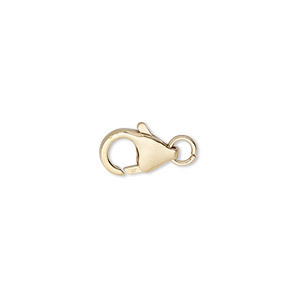 Clasp, lobster claw, 14Kt gold, 13x7.5mm. Sold individually. Item Number: H20-1040FS Have a question about this item? 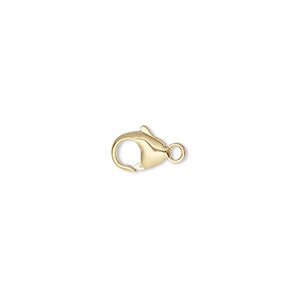 Clasp, lobster claw, 14Kt gold, 13x7.5mm with swivel. Sold individually. Clasp, lobster claw, 14Kt gold, 6x3mm. Sold individually. Clasp, lobster claw, 14Kt gold, 8.25x3.5mm with jump ring. Sold individually. Clasp, lobster claw, 14Kt gold, 7x3mm. Sold individually. Clasp, lobster claw, 14Kt gold, 10x5mm with jump ring. Sold individually. Clasp, lobster claw, 14Kt gold, 7x4.5mm. Sold individually. Clasp, lobster claw, 14Kt gold, 6x3.75mm oval. Sold individually. 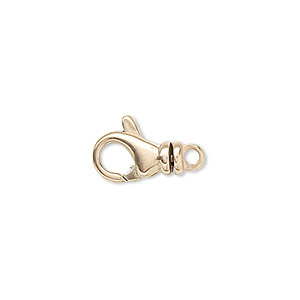 Clasp, lobster claw, 14Kt gold-filled, 7x5mm. Sold individually. Clasp, lobster claw, 14Kt gold-filled, 9x6mm oval. Sold individually. Clasp, lobster claw, 14Kt gold-filled, 12x8mm with 4.5mm jump ring. Sold individually.